$1 for One. Support the crucial work of Polar Bears International by purchasing a SpeeZees Greater Polar t-shirt in Ocean or Danish Blue. Made from 100% GOTS certified organic cotton. Region: The Polar Bear is found in the Arctic Circle and while rarely north of 88°, there is evidence that they range all the way across the Arctic, and into adjacent land masses as far south as Newfoundland and James Bay in Canada. Habitat: The Polar Bear’s preferred habitat is the annual sea ice covering the waters over the continental shelf and the Arctic inter-island archipelagos. Greatest threats to its continuation: Climate change, pollution in the form of toxic contaminants, conflicts with shipping, and stresses from recreational Polar Bear watching and from oil and gas exploration and development. Sleeping mother Polar Bear and her cub, Jonathan Hayward. The Polar Bear is the apex or alpha within its range, meaning it is a predator with no natural predators of its own. Polar Bears are believed to be endangered. Experts in polar bear science predict that as the Arctic continues to warm due to climate change, two-thirds of the world's polar bears could disappear by mid-century—although hope remains if action is taken to greatly reduce greenhouse gas emissions. Due to the absence of human development in its remote habitat, the Polar Bear retains more of its original range than any other carnivore. New evidence suggests that Polar Bears first appeared about five million years ago, making them much older than previously thought. They diverged from brown bears and underwent a series of evolutionary changes in order to survive in the harsh conditions of the Arctic. Scientists recognize 19 distinct populations of polar bears, but no subspecies. 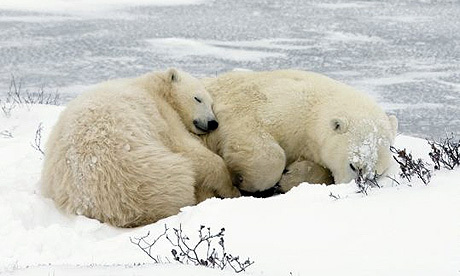 There are five nations with polar bears: U.S. (Alaska), Canada, Russia, Greenland, and Norway. $1 from every SpeeZees Polar Bear tee supports: Polar Bears International, polarbearsinternational.org the world's leading polar bear conservation group—dedicated to saving polar bears by saving their sea ice habitat. If you'd like to make a donation to Polar Bears International click here. The great white bears of the frozen north may face a difficult future. Each summer, the sea ice on which they rely to hunt seals is getting thinner and smaller in extent - threatening to upset their way of life. Here, in this slideshow presentation presented through BBC American photographer and conservationist Jenny E Ross - and Andrew Derocher, professor of biological sciences at the University of Alberta - give their opinions on how climate change is affecting the lives of polar bears, and potentially putting their future at risk. $1 for One. Support the extraordinary work of Polar Bears International by purchasing a SpeeZees Polar Bear t-shirt in Ocean or Danish Blue. Made from 100% GOTS certified organic cotton.